Oh Wolverine. I’ve been an X-Men fan since the early 90s when I saw a cartoon called “Pryde of the X-Men” randomly on a Saturday morning and then subsequently got a trade paperback of “The Dark Phoenix Saga” and became a little obsessed. The action! The pathos! The imagination! I couldn’t get enough. X-Men was my gateway drug into superhero fiction and I fell into a deep, dark hole of it. Maybe it was the metaphor of outsiders finding their places in a world that hates and fears them resonating with me but I also fell in love with the characters. Except Wolverine (and Cyclops, but everyone hates him so this is not a huge admission) who is in my opinion a wildly overrated character. Even the poster is telling us he’s better as a drawing. for the character in my view. And, the character was such a success that, much like the comic origin, solo projects were assured. The first one- 2009’s X-Men Origins: Wolverine– was basically terrible. Both from a critical and fanboy perspective, the first Wolverine outing was plodding, nonsensical, bizarre, and ridiculous. It made the character even more confusing while muddling his origin story-which was, like, the entire point of the movie- and doing little to bring in new fans- well, besides new fans hearing all of their fanboy friends’ screams. Even as a non Wolverine fan the film made me nerdrage all over the place. 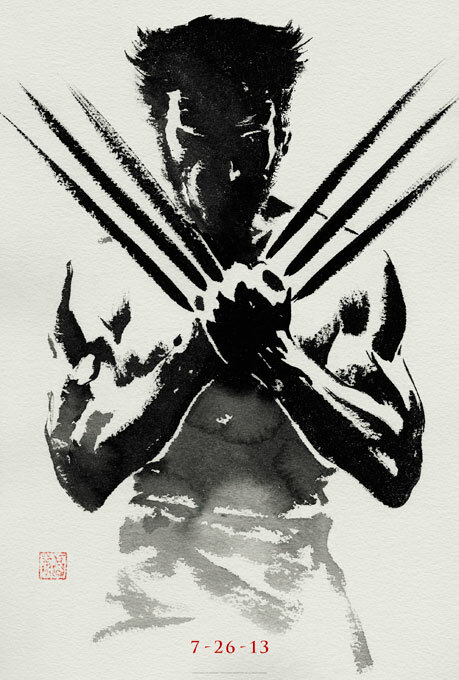 With The Wolverine producers promised a return to form, a film that will make Wolverine fans old and new happy again, like they were way back with 2003’s X2: X-Men United (2006’s X-Men: The Last Stand was fine and this film does immediately follow it in the increasingly complicated continuity but X2 was way more awesome.) The movie covers Wolvie’s time in Japan, a deep and important time in his comic life, and…screws it up. In the comics: during this time he became a samurai, fell deeply in love, and basically had an entire life. THIS FILM decides that he was in Nagasaki during WWII, saved a guy from the bomb and…left. He returns shortly after the events of Last Stand having basically gone bonkers (like, moreso) after the death of Jean Grey (Famke Janssen) [Aside: Let’s ignore that “the death of Jean Grey” is a sentence used so often in comics that it’s canonically laughable, but in comics their relationship-while meaningful- isn’t his overwhelming love. He loved her deeply, but he knew that her heart was always really with Scott and he grudgingly accepted that. The movie canon has decided that Jean is the sun around which Logan revolves] to say goodbye to the man he saved. Who in turn wants to “cure” Logan of his mutation and transfer it to himself. Somehow. It’s also implied that the man thinks Logan’s admantium is as much his mutation as his healing factor and claws. Which, no but whatever. Logan loses his powers (the healing factor, his claws and super senses [which are remembered only when convenient] he keeps so it’s confusing) and goes on a slapsticky, red herring filled romp through Japan. I have never seen a movie unravel this quickly. Within 30 minutes, there are so many plots and shady agendas that your head might spin, except it’s all so boring that you really don’t care. By the time the film reaches its conclusion so much ridiculous crap happens. It’s…I mean it’s almost impressive how completely insane the last 45 minutes of this film are. The height of the insanity is the main villain, I suppose, in the person of Viper (Svetlana Khodchenkova). She says at one point that she’s the master of poisons both physical and metaphysical. Huh. OK. You sure about that one? Cool. Anyway, nothing about her makes any damn sense, especially at the end when she COMPLETELY OUT OF NOWHERE takes her name too literally. She does change outfits every scene (at one point seemingly in the middle of a conversation) which is fun. I feel like the 2 writers split the work by writing the villain arc and the plot separately and then smashed the 2 drafts together and just kind of went with it. However, if this movie has done one thing it’s that it’s brought Rila Fukushima into the spotlight. As Yukio she is tough, funny, and made of awesome. The film version varies from the comic character (as I remember her) but I think this is an improvement. Fukushima, in basically her first role, owns this movie. Her performance is more dynamic than anyone in the cast and her interplay with a certified megastar like Jackman is fearless. She is by several miles the best thing about this mess. The movie ends, as is obligatory at this point, with a stinger (the official name for the end credits scene) that acts as a teaser to next year’s X-Men: Days of Future Past which is the direct sequel to 2011’s X-Men: First Class and will no doubt simultaneously wreck and resnarl this ever mind-bending continuity. This is the best single scene in the entire film. I’m not even kidding.